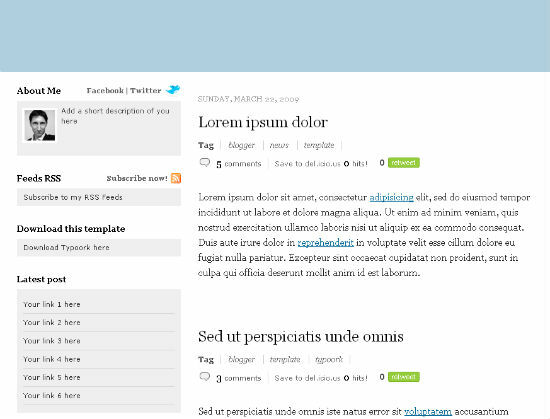 After a long time, Antonio Lupetti released another clean and professional blogger template. It is highly customizable template and it supports inline comments form, delicious and retweet counters in each post. Woork templates load too slow but I didn’t checked for errors. Anyways which template you are using ? Its similar to woork’s previous template. Thanks for your suggestion. I’ve disabled word verification now, I forgot to do that and I’ll make my blog dofollow later. Your template is great. It loads fast but your header doesn’t match with your template. Bariski I already checked the code to make it a do follow blog but I may not make it a do follow blog. It make a lot of spam in the comments. Well thanks for telling the code :). Anyways your blog is a do follow blog. Don’t you get the spam comments ? I think if you need a completely customized theme, then you would have to design it. Really good theme. Thank you.